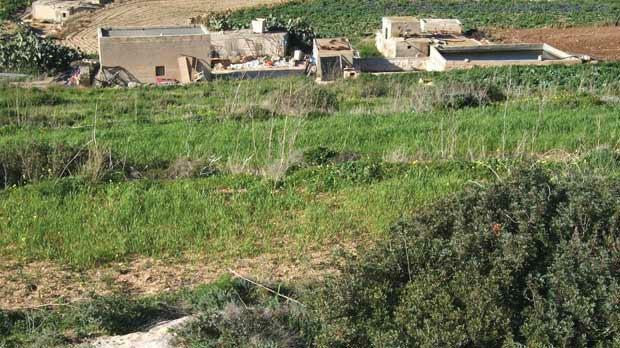 The Devil’s Farmhouse, Mellieħa, overlooking an essential watercourse for farmers, who fear a appeal tribunal on March 6 could dismiss Mepa’s refusal to sanction a nearby illegal fireworks factory. 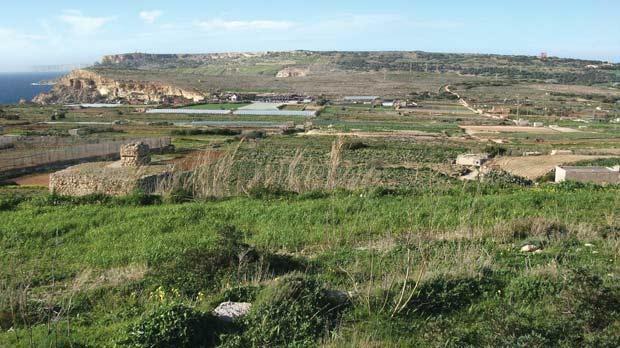 The illegal fireworks factory in a field at Tal-Għajn, Mellieħa, (partially seen at far right) borders two watercourses, posing a potential threat to the quality of irrigation water in nearby seasonal streams and underground. Close-up of the illegal fireworks complex of buildings. A non-descript group of rural buildings, near the bypass in Mellieħa, has gone largely unnoticed by the public as a covert base for the illegal manufacture of village fireworks. Some tattered festa decorations lying around on site belie the apparently innocent appearance of these ‘agricultural’ structures. 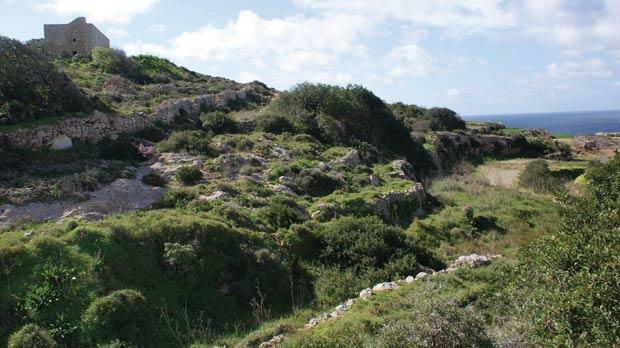 Within a stone’s throw of the main arterial road linking ports in the north and south of Malta, the primitive explosives factory, dressed in a farm building cloak, had been operating unhindered. The safety breach was no secret to the enforcement section of the Malta Environment and Planning Authority, which swooped on the applicant with an enforcement notice when he defied the authority to carry on with his business as usual after an earlier application to sanction was withdrawn by the planning authority. Only local farmers and Mepa enforcement officers were privy to the breach in planning and safety regulations dating back five years or more. After Mepa’s refusal of a permit in 2011 to sanction the activity and build a new structure, this application is up for appeal next month. Lying between two watercourses supplying local farmers with seasonal water for irrigation of their crops, the fireworks factory proposal is not welcome. The factory footprint is adjacent to a popular walking route between Majjistral Park and Popeye village, passing features such as the well-preserved ruin Razzett tax-Xitan (The Devil’s Farmhouse), a Grade 1 protected site. Under the latest planning policy for fireworks complexes (which was open to public consultation until February 7) it is unclear whether existing judgements on such a development will continue to be upheld, or turned on their backs. Among comments submitted to the Director of Planning during the public consultation period was a request for new fireworks factories not to be considered near historic sites. Residents of Żurrieq can vouch for the distance that debris from a powerful explosion can fly when large stone blocks ended up on the other side of the valley after their fireworks factory blew up in 2007. The architect for the case was one noted for his attempts to steward a number of sanctionings outside the development zone surrounding the pretty village of Mellieħa. The Explosives Committee, made up of representatives from the Arm­ed Forces of Malta, Police and Civil Protection, found no objection to this proposal. This committee simply decreed that the site was suited to the purpose of constructing a fireworks factory as easily as claiming a green field suitable for a car park. The striking reason they came up with to support the application to sanction was that the structures “earmarked for reconversion” had already been used for the manufacture of fireworks – an argument that was shot down by the environment protection directorate (EPD) as one that could not be taken as a justification to commit land to this use. “A fireworks manufacturing site has specific needs in terms of infrastructure requirements, such as adequate access to accommodate fire-fighting vehicles, water storage, etc, as well as creating an increase in vehicle movements due to import of and export of raw materials and products from the site respectively. “Karstland is important in terms of geology and biodiversity. The EPD objects to the proposed development since it shall lead to the loss of a large stretch of garigue habitat which runs counter to Structure Plan policies RCO 8 and RCO 10. With no beating about the bush, the report says that such a sanctioning, with all it entails, would result in further change in the characteristics and visual composition of the surrounding landscape. “The reclamation of karstland for development should be resisted within the karstic landscape, which is characterised by a diverse suite of species of conservation value. “Additionally, the approval of the proposal would create a precedent for the other illegal development throughout the surrounding landscape with significant cumulative impact on the ecological and scientific value of the site. The area has been on a waiting list for scheduling as a Level 2 Area of Ecological Importance. The landscape is dominated by vegetation and communities typical of garigue and steppe habitat, small patches of agricultural land interspersed in boulder scree habitat. An objection from the Department of Agriculture was received by Mepa on the grounds that agricultural structures are to be retained for their original purpose. The department said that rather than rewarding contraveners with sanctioning, any disturbance to the site by the developer should be removed. Nowadays, farmers are investing large sums of money to become competitive and provide consumers with fresh quality produce. The Malta Farmers Association wishes to be assured by Mepa that any applicant will be constrained to conduct a professional study to establish what buffer zone is required to ensure that no damage will ensue as a result of explosion of similar damage from fireworks factories. The study must take into consideration the type of farming being conducted, structures in place, type of farming activity, irrigation system, water supply and water sources being used on the farm, including watercourses. The association feels that any distance less than one kilometre would be prejudicial to the farmers’ rights. Statement by the Malta Farmers Association.